First, thanks to all who took the time to leave such detailed comments-we love it! Now, let's get down to business. First, we HATE IT ( like Rachel and most of you do, I'm sure) when people don't obey leash laws, especially when they have powerful breed dogs who can do some real damage. We also agree with what Cat Chat said: "that even the nicest dog can be bothered by the reaction of another dog". I know that for sure because I'm one of those "nice dogs" that get a bit scared and stiff around big dogs (I do put out weird vibes, when I'm scared!). It looks like we weren't mysterious enough this time-most of you picked number one, which is exactly how Parental Unit reacted. But...she did tell me that the woman's comment made her feel like an over-protective mother...and if she had a therapist, she might have actually made that phone call:-). A part of her also wanted to remind the lady that those big dogs really should have been on a leash, especially in such a crowded atmosphere-but why engage in confrontation when you can avoid it and berate yourself instead?! Check back next Monday when I'll make sure than Parental Unit makes the choices a bit tougher-and there will be a small prize for the comment that nails it! I am really enjoying these Monday "what would YOU do and what did I do?" posts! Glad you're enjoying them! 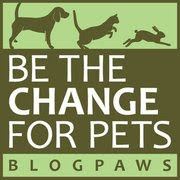 I'll look forward to seeing you (in person) at BlogPaws! 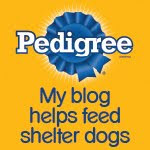 BlogPaws??? Where will that be? and When? I like these Monday thingys, too.